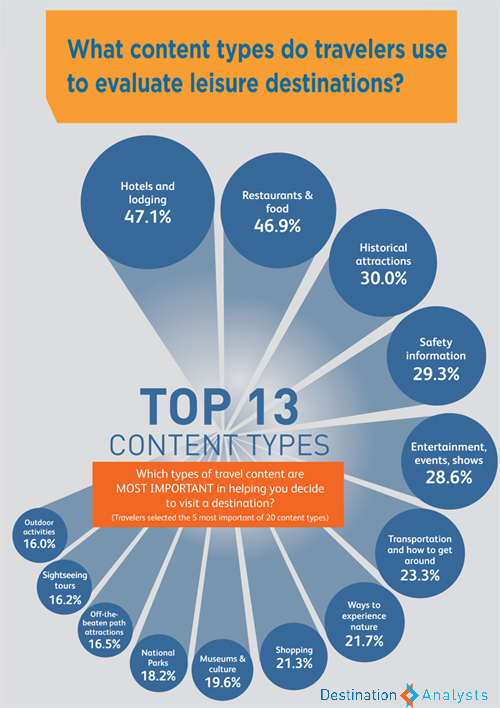 Which Content Types Matter Most in the Destination Decision. Plus Other Insights from our Latest The State of the American Traveler Report. The early 2015 edition of our The State of the American Traveler report is now out. As always, this edition explored several topics relevant to travel marketers and uncovered some fascinating insights about American travelers. One of the most interesting included the types of content that travelers feel is most relevant to their ultimate destination decision. Long time followers of The State of the American Traveler may recall a similar question asked one year ago. This time, we removed the concept of cost—something most of our destination marketers cannot control–in order to really look at what content motivates the desire to visit. Interestingly, hotel and lodging information still reigns supreme. However, this is closely followed by restaurant and dining information. People are most interested in where they sleep and what they eat when it comes to picking the destination.